I sent off a small package this week, and it didn’t include one of my books. My friend, R, is celebrating her 60th birthday this week, which is a golden anniversary of our friendship. She and I have become mostly Christmas Card Friends, but on those rare occasions we do get together, the years melt away, and I’m smiling at my buddy who shared learning how to do flips on trampolines, and swam with me like a fish ever since we met in Mrs. Clark’s forth grade class. HAPPY BIRTHDAY, my dear, dear, friend. 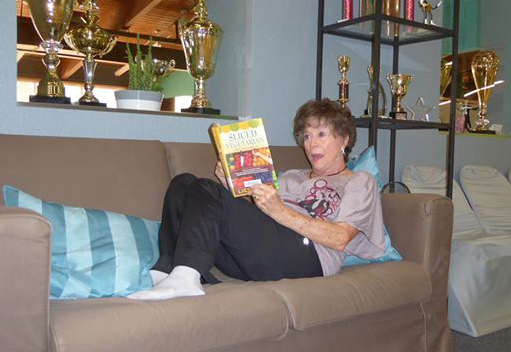 Thanks to my friend, Myrna, for reading between dance lessons at Colorado Dance Sport! But sending that package reminded me that this is it, the BIG year for me too. At the end of March I will mark six-oh! on my timeline and I’ve been searching for ways to celebrate. I’m not a huge traveler, so a trip just wouldn’t stick in my mind as something I’d truly like. Greedy guts that I am, I want something more. Question is, what would really be the fireworks of my official entry into old-age? One thing is that I’ve always wanted to share a real conversation with a national celebrity. Bill Maher would be great. He turns 60 on the twentieth of this month. I wrote and asked his publicist if my husband and I could take him and a guest out for dinner sometime between our two special dates. He didn’t say no. He didn’t say yes, either. Not even a “no comment” came back. Hmm. So much for star gazing. I set up my author Facebook page a few months back, but so far, I have no likes. I don’t think anyone but Prophet and I are aware this thing exists. Starting in a week or so, I’m going to figure out how to post my blog there instead of my personal FB page and see if I can get 60 people to like it by March 31. Will you help? Can you tell your friends that this goofy author is looking for likes? Smart goals are time specific, so again by March 31, I hope to post 60 tweets on Twitter. This should be easy, but it requires that I actually visit Twitter more than once a month or so. Are you on Twitter? Want to start a convo? This could be cool. Ouch! This one is going to push all the magic skills the Birthday Fairy has. Right now I have 6 reviews on Amazon, no reviews on Barnes and Noble and 6 reviews on Goodreads. I also have reviews from Publishers Weekly, Kirkus Reviews, Wisconsin Bookwatch and Booklist Review. Three author friends wrote blurbs, and thank you very much to them. That makes 41 more reviews to acquire. Do you know anybody who likes being the next great critic on Goodreads? Please let them know that Sliced Vegetarian is in many local libraries in the US (and even one in London!). That’s right. No more goofing around. By March 31 I will have at least 60 pages (or 15,000 words) sizzling on the computer, begging me to finish this project! Right now, I’m sitting at about 2,000 words, so it’s time to kick into high gear. I’ll keep you posted on progress here. Wow! I have a really hard time sticking to 24 books in a year. How can I get 60 read? Why should I do this? The why is easy–writers are readers. We soak up information and ideas through constantly reading and observing. I’ve been a slacker on the reading front. How is a lot more difficult. I’ve selected two books for January, but I need to read three more. A friend of mine gave me is “cheat” idea–read white papers, short story collections, and yes, children’s books. Talk about getting excited to read again! Good-bye Sudoku and Spider solitaire–2016 is going to see Liesa turning the page on those time wasters. Do you have any short book ideas or ways I can get 60 books read this year and still have a life? I’m going to handle this one, friends. Going to go to Brooks Brothers or Neiman Marcus–one of the stores that has a tailor and I’m going to go all out with an outfit collection–skirt, pants, dress, jacket, couple of blouses and maybe even the shoes to go with all this (six pieces at least). Think of those magazine articles that show you how to have a one special, multi-purpose outfit that creates the foundation of your wardrobe. Look out, What Not To Wear, Liesa’s going to look good at the big six-oh! If you have any way to help or give me ideas, please share! I’d also appreciate it if you could link this article to your social pages so I get a better chance of turning 60 in style. Thank you, thank you! This entry was posted in Personal Travels, Working With Words by Liesa Malik. Bookmark the permalink. Fun and interesting read, Liesa. Good luck with your quest! Thanks so much, Marty! I’m working hard on those goals I have control over. Fingers crossed for the rest. Hope your dancing is going well. Will you be in the showcase this year? See you soon.